an elderly young writer of Speculative Fiction. Flash! Two free eBooks now available from www.screwpulp.com..! Just enter "Thorne" in their Books Search Box. but do see my HOME. page too. Welcome to my website ... this is the latest news page. BIG PROMOTION MONTH for my POINTS OF VIEW SERIES - A page turning saga for all ages. The first four books in this SciFi Espionage series cover our previously blind hero's progress since being fitted with nanotronic smart AI eyes. In his new job as apprentice to a government secret agent his personality changes as his hazardous experiences affect his outlook on life and his adventurous dreams become ever more vivid. His intelligent eyes also evolve more abilities as he needs them, using most of the electro-magnetic spectrum. The page turning action in this series takes place all over Europe and in the Americas as the agents battle with the Grey Brigade, a gang of international terrorists funded by an evil billionaire, who is after the secret of the eyes to replicate them into his range of illegal robot battle machines. Book One in the series is free, and Book Two is half price!! Only from Smashwords. Don´t miss these limited time offers..! Click here for Book One. Click here for Book Two. Send me an honest short/long/good/bad review of it and I'll send you eBook Three for free. Use the Contact Me link over on the left. This ongoing series covers the hazardous adventures of a previously blind young man now fitted with intelligent nanotronic eyes. They can develop new abilities, using most of the electro-magnetic spectrum, to get him out of all kinds of danger in his new job as apprentice to a government secret agent. That was the price to pay for the eyes. His hazardous experiences cause his personality to change and dreams to become even more vivid, but they don't always end successfully. Book 1 covers his early training and first two missions. Book 2 features the agent's missions to locate and recover 5 stolen beam weapons, which only he can activate. Book 3 moves the action to America where he is kidnapped by a rogue company developing battle robots that would benefit with his eyes, and Book 4 with the action taking place in Cuba and Morocco, has even more thrills. It will be published early in 2019, but advance review copies are now available. Why not get your free copy now and be the first to have your review featured. If you review Book 1 or any others in the series you will get the next one free. I only want honest, any length reviews, good or bad. To comply, use the Contact Me link on the left side of this page or eMail me to: tonythorne@aol.com. From the Author - Thanks for reading Book One in the series, any comments? Colin Kirby (Journalist, Tenerife) said: This is a thriller, a science fiction adventure, but most of all a good old fashioned ripping yarn with a compulsive plot. Rebecca Minto, (Writer, USA) said: I lost a little sleep reading Points of View because I simply couldn't stop until I knew what happened next. New..! Extract from a Book Club review of the earlier eBook edition. "I thoroughly enjoyed the plot of the book. I found it to be exciting and certainly novel. I found myself turning the pages quicker and quicker as the larger plot unfoolded, following along with evey twist. I was right there with the crew during the helicopter flights, thinking up new strategies to find the missing weapons. All in all, the story line is excellent and certainly thrilling. I would recommend this book to readers who enjoy futuristic technology and action packed top-secret military missions... "
The Weapons is the second book in the series, Points of View, by Tony Thorne MBE. The protagonist of the story is Horace Mayberry. Horace is a teenager who lost his eyesight in his early teenage years. He later got a new set of eyes. However, his new eyes were bionic. Professor Oscar Freeman developed the eyes in his research laboratory. Due to the highly advanced nanotechnology that Oscar used to develop the eyes, they possessed more than the ability to see. They were a form of government weapons. Did this mean that the teenager would become a secret government agent? What would a teenager’s work be in a government agency? Would Horace perform his duties professionally? Would he be able to meet all the qualifications for an agent serving in a top-secret government agency? The teenager’s abilities were put to the test when a terrorist group broke into the professor’s laboratory and stole prototypes of a new weapon that he was working on. The book revolves around the involvement of Captain Horace Mayberry, the teenager, in recovering the stolen weapons. I loved several aspects of the book. The author did an amazing job with the choice of and development of characters. For instance, the protagonist of the story is a teenager who takes on huge tasks in a special unit of the government. 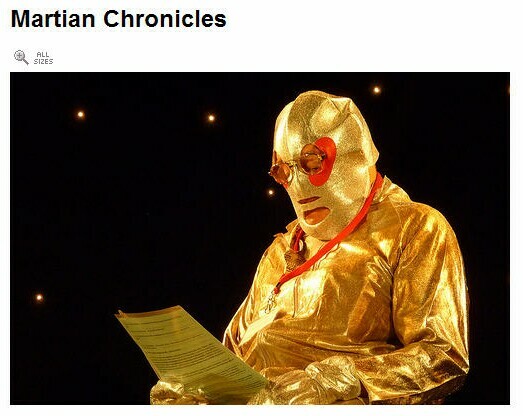 This made Horace a superhero. He helped to take down a terrorist group with his bravery coupled with the use of his special eyes. Another likable character was Aubrey Jackson. He worked closely with Horace in all the dangerous missions. Through the recovery of the lost weapons, the author gives the reader a picturesque aerial view of parts of Europe. Horace, who lived in Kensington, got a chance to travel to other parts of England and Europe. The countries that Horace and his team went to in their search include Scotland, France, and Austria. Austria’s features i.e., mountains, valleys, and the dozens of old castles made it the most beautiful. The only part of the author’s writing that did not meet my expectations was the development of scenes. During the recovery missions, the author makes the encounter with the terrorist group members very short. This is the part where I expected to get some real action and some sort of resistance from the terrorists. However, after Horace’s eyes did their magic, everything else seemed to be swept away quickly. I wished that the author could have added some meaningful twists and turns to spice up the scenes. If it were possible, I would give the book 3.5 stars. However, the author managed to keep me glued to the pages by creating a suspenseful story. Therefore, I give the book 4 out of 4 stars. 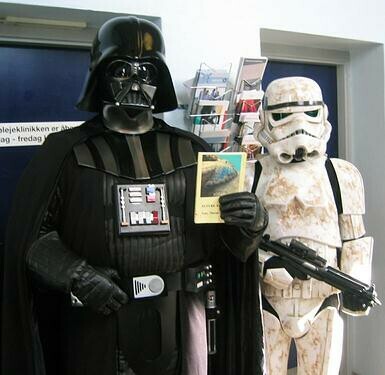 Readers who love Sci-Fi books will really enjoy reading the book. I look forward to reading the next book in the series to learn more about the special abilities of the professor’s weapons.’s weapons. Important Note: My old distributors and some other outlets are still showing the obsolete first 2 books in this series, with higher prices and the different old covers, but they may not be able to deliver! Make sure you only order books with the new edited better contents and the new 'artificial Violet/Green Eye' covers. Some new reviews for Book One. 5.0 out of 5 stars - Exciting, Imaginative Series Kick-Off! After losing his eyesight, Horace Mayberry receives artificially intelligent, adaptive bionic eyes in exchange for joining a secret military group. As Horace is swept up into a series of international adventures, his eyes adapt in ways he could never have imagined, converting him into a superhuman counter terrorism agent. Points of View is an exciting kick-off to what is sure to be a great series. I’m eager to continue the adventures of young Horace! The Points of View series is an excellent one and, having recently re-read this first in the series, I am reminded why. The characters, in spite of the rarefied world in which they work and live, are very accessible to reader. They're likeable. Chief among them is Horace, the young man who suffers the loss of his vision but has always longed to be a secret agent. Having a dream come true thrusts him into a life of responsibility, challenges and opportunities. Each risky situation Horace encounters cause him changes both personally and professionally. It's an exciting read. There is solid action and very good insights into each agent's role in their adventure. This is truly a page-turner and very well-written. If you have a young person in your world whom you think ought to get back to reading 'real' books I'd recommend not only Points of View One but certainly the entire series. This was an awesome read. I loved the narrative technique threading dream and reality in and out like a plot within a plot. It was dark, deep and mysterious. How science can facilitate both in a super-human existence, and cause pitfalls to occur on account of that kind of existence. it is a must-read for all interested in nanotechnology. If you're looking for a recently written story (that is, recent as in NOT from the era of Heinlein's Juveniles) for a teenage boy, this is a great choice. The SINGULARITY - Technical products are getting smarter every day, but can we all keep up with them. Yes, The Singularity is coming..nearer! WHAT WILL HAPPEN NEXT? If you order the following English Language book, which has already sold over 4000 copies of its Chinese version, I'll send you a free eBook (.pdf copy) of any other book you'll see when you scroll down my Amazon pages. Use the Contact Me link on the left. Don't miss this chance to learn about what is definitely going to happen to our way of life... and sooner than most people realize. In fact, it may have started already. Noticed anything quirky about your computer, or iPad, or smart Phone lately... I certainly have, and it cost me a new hard disk for my laptop? But then, surely that cannot be because I'm becoming a threat? Have you tried downloading any free software lately... it's not as easy as it used to be..! Why does the Internet often now, appear to want to be playful wih us... or worse..! Latest eBook edition..! More about the Intelligent Robotics Revolution. Latest news and analysis, including some new thoughts about AGI self-awareness and what it may reveal about us. It's now available from HERE. I've just updated my SINGULARITY book with the latest news. This new edition has more experts' comments..and several new thoughts on the subject. Use the Contact Me link over on the left for a free copy (.pdf) if you have an earlier version... Otherwise it's also free if you will send me a few words about it when you've read it. Some experts now predict unemployment could reach over 80% in less than 8 years now. If he lasts out that long, what will The Donald do about that? How will he react to the arrival of new intelligent life forms with an IQ greater than a value of 150 which he claims he has..! More and more companies are thinking about how the new (24 hours working) intelligent robots can each replace at least two of their expensive human workers. The eBook in its Kindle version is available from Amazon, and it is also now available in all the popular formats i.e. .epub, .pdf, .mobi from Smashwords and its distributors. Now how about a run through the following video..? How about a different kind of Alien Invasion..? Yes, this is my latest fiction, updated from an earlier version in one of my collections. It's available now from Amazon as a Kindle eBook. So what is it about? A vast mother ship arrives on our moon and waits. Humanity debates its ominous purpose and tries to contact it, unsuccessfully. Then part of it begins to open up to discharge many robotic heavy construction machines that appear to be intelligent. They begin to level off a large area and build a base, but for what? Then the enormous ship takes off and heads for earth. Now scroll down for more news..! Use the Contact Me link in the left column on this page for a free .pdf copy, if you'd like to review it, or to just send me a comment or two. "Very inspiring book. It has one of the best lines I’ve ever read. "Trials and tribulations presumably scatter in the breeze with the dust of the thing as it crumbles in your ﬁst. or shatters under your heel." Wow. truer words were never said before. The intro that explains why you might consider writing as a therapy is quite humorous and original: I know that you can use writing for therapy. but I have never seen it explained like this anywhere else before. The autobiographical section is extremely inspiring: any wannabe writer who is on the fence about taking the plunge should read it and especially re-read this passage several times - "if you don't have the time to be a perfectionist. there can be contentment in accepting adequacy, deﬁned perhaps as the acceptable limit of one's abilities. I also suspect that the trick is to never give up until you get as far as you truly believe you can...or maybe stop just before that." What follows is an account of a how a person became a best selling writer - the account illustrates the aforesaid passage quite well. My issue. with the story of the maverick writer is that he follows a rather unethical in order to build his own career. Something I would never do, no matter what. Would I?" Another Fact to Fiction item. Forward or Backward, both have their hazards. Going Back is surely not possible and the text and tales explain why. Going forwards, yes it is is possible, we`re doing it all the time... slowly. Faster is possible, but beware the delay effect explored in a couple of tales herein. Consider this paradox. Suppose you went back to the time when a young William Shakespeare was first thinking about writing some plays. Then offer to sell him a printed copy of them. Think of the time and effort that would save him. Better still make a deal with him wherein you get a royalty from the plays, and get him to invest it in your name...somehow. Think about how much the interest would have grown by now. 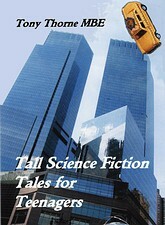 This quirky, speculative, near SF fiction eBook, story was free from Amazon recently, but for the time being it isn't. It's still good value though so don't miss it, and if you review it, wih Amazon on their website, I'll be happy to credit you with any other eBook you find on this website. The awesome Hi-Tech slimming device featured in this tale is feasible... but would you want to try it out?... As does the main character in this unusual, slightly chilling, tale, together with his 3 unwary companions. There's a twist in the end which you may not see coming... please do let me know if you do. Best comments win a free copy of any other eBook on my website...! Use the Contact me link over on the left.... a bit higher up. FLASH! Comments and Reviews offer, to remind you again. 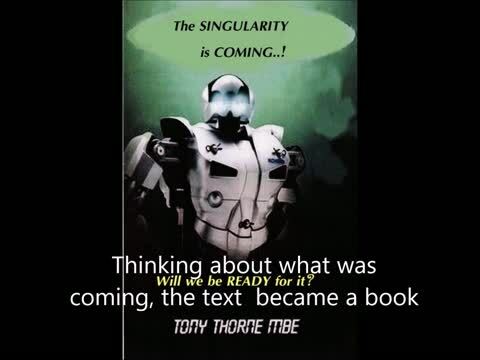 Speculative Fiction writer Tony Thorne MBE (89) recently signed a contract with the IT Books Division, Posts & Telecommunications Press, a branch of the Chinese Ministry of Information, based in Beijing, for eBook and paperback versions of his latest title, THE SINGULARITY IS COMING. Copies of the first paperback print run, in Simplified Chinese, will retail from the end of April 2016 at the attractive equivalent price of $6.20 (US dollars). The eBook will also be available then retailing at around $3.00. Copies of the worldwide English language versions have already been similarly priced. BOOK CONTENTS, in all versions. Artificial (General) Intelligence, or AGI is coming and will change our way of life dramatically, following on from the Smart Devices we use today. Even more amazing developments are on the way, leading to AGI and the Singularity, an event which cannot be reversed. Many experts believe this will happen in less than nine years, leading to robotic machines far more intelligent than we are, and thus able to do any jobs that humans can do, faster, better and for longer. Many experts believe they will also have awareness, plus the ability to replicate themselves and develop their “learning” software leading inevitably to ASI (Artificial Super Intelligence). The runaway consequences of that incredible development will change our way of life completely. Will we be ready for such a devastating event? Will it be a threat to humanity as several experts believe, and block-buster movies, predict? Others claim it will benefit us in ways we can hardly imagine, such as a healthy age of leisure with everything free. This easy to read book for general readers, explains what is about to occur and why. It also has sections describing the latest developments and includes a comprehensive further reading list. It also features many “For and Against” comments and arguments by various international scientists and engineers. So who will be correct? Read this book and decide for yourself. I'm mostly a writer of speculative fiction, all kinds of 'what if' tales about what might well happen in our near future. Yes, I'm a futurist, converting present day facts to near future fiction, and it's becoming more challenging every day... due to the ongoing technological explosion. For example, The Artificial Intelligence Revolution... where the race is on right now to create advanced AI, for both good and bad reasons. What you need to know is simply explained, for general readers of all ages, in my Kindle eBook and paperback edition, THE SINGULARITY IS COMING. View it later, after you've had a look lower down at what else I've written, by a single click HERE. Meanwhile, if you click on the ROBOTS INCLUDED link over on the left, you can read about more stories outlining what many experts are certain is imminent, and will affect us all. Next, please do have a look around this website at the rest of my fiction output, and especially what reviewers say about it. The different titles are described in the sections listed in the blue left hand column. However, if you now scroll down this page, and I hope you do, you will read my news about recent events, and new books, as they occurred. Otherwise, you can view my Amazon Author Pages HERE. If you don't have the time at the moment, then please do come back for a longer look when you do..! ONGOING PROJECTS: What am I currently working on? An updated collection of my MACABRE TALES with several new stories. I currently expect to call it.. SPECULATIVE TALES; THEY COULDN'T HAPPEN ... RIGHT? My award winning Macabre Tales collection has new *****Customer Reviews which you can read now on any Amazon website. The award it won was in a recent, Best Halloween Book Festival contest over in New York city. See more about it using the link in the left hand column and then to consider buying a copy just enter "macabre thorne" in the search box of any Amazon, or B&N etc. website. Yes, that works very well..! It's available in both eBook and paperback versions. Quadcopters are all the rage..! Here it is, now available as a Kindle eBook, hilarious, quirky, murky adventures. The complete Bill's Helical Blues... All the amazing adventures of Bill, our hapless hero, his long suffering wife, and his brand new (replacement!) model helicopter. More mystery and mayhem and even murder ensues..! Don't miss this one for an entertaining read and maybe there's a good idea in there for a profitable weekend business for you too. 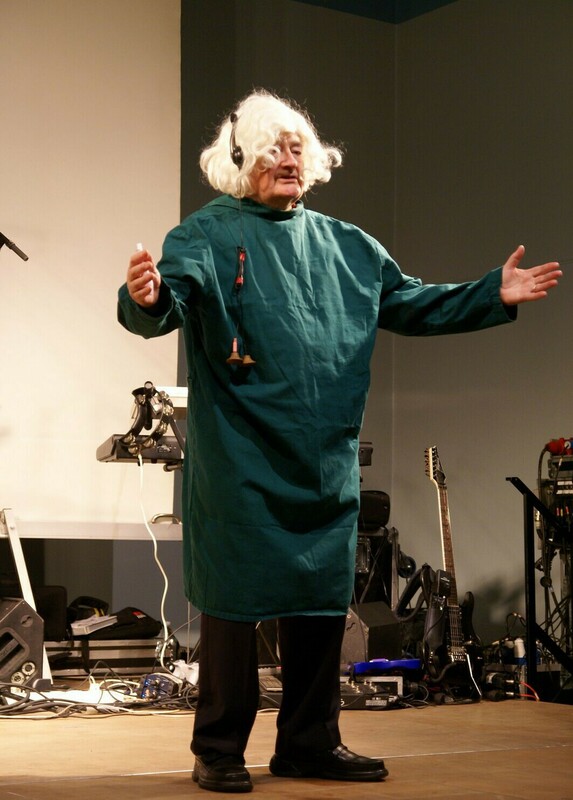 Some reviews of THE SINGULARITY IS COMING – The Artificial Intelligence Explosion - Through AI to AG(eneral)I and then AS(uper)I.. (I)ntelligence! My tall SF tale TESTING TIME, illustrated and translated into Spanish, appeared first in the long established Argentine magazine AXXON - Issue number 172. So, if you know the language, check it out on - www.axxon.com.ar or read it in English in my second collection, FUTURE UNCERTAIN. 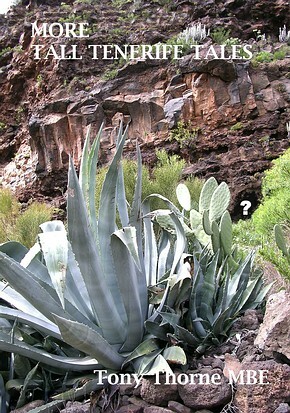 Meanwhile If you do read Spanish it's in the first translation of some of my Tenerife Tall Tales, into that language... ready now from Amazon as a Kindle eBook or a paperback. Here's my collage cover... guess whose photo that is on the right..? INSIDE INFORMATION - It's just what you need..! Yes, this is it, something quite different... both the paperback and the eBook versions are available now! Quirky tongue-in-cheek comments (cynical to hilarious), with some useful advice, on (almost) everything you need to know in order to survive in this modern, mad, materialistic world... and it's also about the side effects you'll probably encounter, and how to handle them..! I often use it for items to perform at parties, conventions, business meetings...whatever! There's even a short sketch for a married couple to perform. Why not ask me for, or even buy an (inexpensive) copy now and then write a review of it... to appear on my Amazon page(s) and all over? My (printed) books are now available from MEGATONE, the excursion tours agency, car rental, DVD Library and several other things. They are situated on the SW coast road (Avenida Maritima) that leads to Puerto de Santiago, a short way down the hill from the Barcelo Varadero Hotel. Telephone: 922 862152 open from 09.30 to13.00 and 16.30 to 19.30 every day. When ordering, make sure you click on the lowest prices shown therein ... the higher (duplicated images) ones are incorrect, and I hope Amazon will cut them out soon, as (often) requested..!!! FLASH! By the way, if you don't yet have a Kindle, you can download their new KINDLE FOR PC program, which is fast and easy to use , when downloading the stories too. New successes to report ..! 2. A recent short fiction item DEAD RINGER won the August 2010 Flash Fiction contest promoted by the Judge My Words website i.e. http://www.judgemywords.com/ Yes, it is now included in my MACABRE TALES collection. Another couple of interviews ..! This enormous event was held in the Radisson Hotel, Heathrow, close(?) to London ... and yes, I was there ... in disguise! An early wacky tale, TEETHING TROUBLE (reprinted from my FUTURE REASSURED collection) , is now in issue number 8 of the American Astonishing Adventures Magazine ..! You can read it via these links ... under the preferred USA title of TEETHING PAINS. 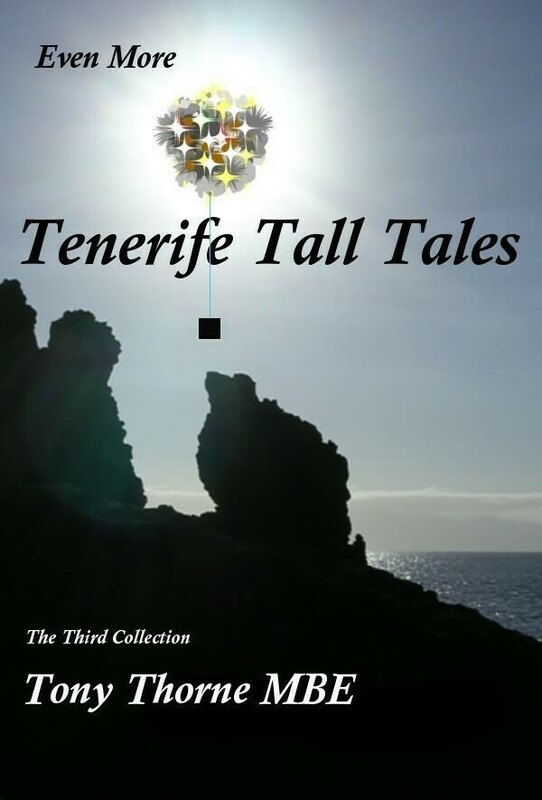 TENERIFE - Tall Tales, now a 40 stories trilogy..! Here's the award winning first in the series of three collections, each with seventeen tall Tales with a twist in the tail, and an introduction by the late legendary Harry Harrison himself! This collection is published in the USA as a paperback by Whortleberry Press, and in Europe by Etcetera Press.and from all the usual outlets, including Barnes & Noble, WH Smith etc. at around $13 (USA dollars) or 7 UK pounds, or about €10 (euros). For review, and signed, copies use the Contact Me link on the left, much lower down. See also the Offers link on the left. What else might I suggest...? The second and third collections in the Tenerife Tales Trilogy are available from most suppliers. Send me an eMail for an offer for the complete set... using the Contact Me link! Available now as a paperbook and an Amazon eBook, and for free review (.pdf) copies only... just drop me an E-Mail ... using the Contact Me link on the left further up. You can buy either from Amazon's site HERE. 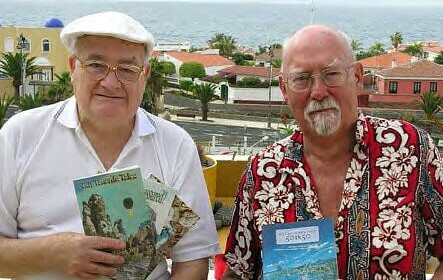 The late legendary, SF author Harry Harrison visited Tenerife in November 2007, for a magical week in the sun. We had a truly great time together chatting about events and personalities, past and present. He also read a review copy of my first volume of Tenerife Tall Tales, and honoured me with an introduction for it! In May 2008, he was the chief Guest of Honour at the Eurocon, in Moscow ..! For more about Harry, visit his website by entering his name in any search engine, to locate it ... and many other sites featuring him. Photo by Colin Kirby, from the Tenerife Sun, a half page newspaper article about us both. "Tony who?" Yes, I did discover at least one fan of mine there ... and even made some new ones... and DV himself is insisting, "Buy your copy immediately ... or else..!" Back to my News Page Here Go to my Amazon Authors pages Here.